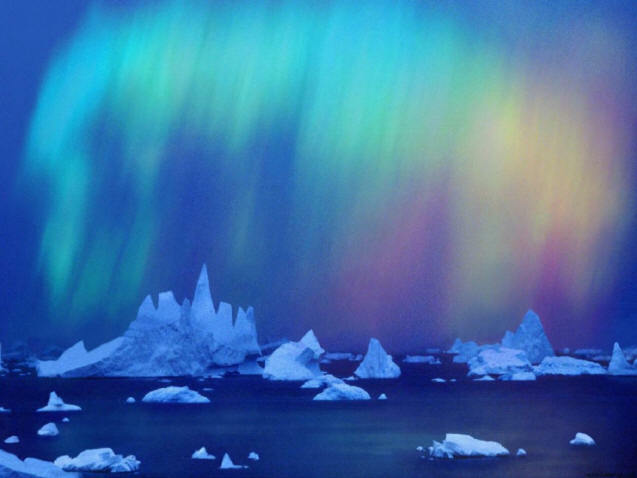 Aurora Australis over the Bellingshausen Sea. Photographer unknown. Our fortunes are inextricably linked to the Sun's activity. This is a principle tenet of Electric Universe theory. his wagon to a star, and see his chore done by the gods themselves. Many Picture of the Day articles discuss the linkages between galactic electric currents, solar electric currents, and terrestrial electric currents. Earth is connected to a circuit that flows through the cosmos, but that circuit is difficult to perceive. Recently, a research team from UCLA announced the discovery of a "previously unknown" mechanism for transmitting energy from the Sun into Earth's magnetosphere. Charged particles called the solar wind erupt from the Sun in all directions, but how the electric charge is transferred to the magnetosphere is a mystery. Natural processes depend on energy input of some kind that then changes from one form to another: chemical energy is released by fire, which is then changed into heat energy that can boil water and drive pistons with kinetic energy. Consensus views also suggest that this holds true for the geomagnetic relationship between the Sun and Earth. According to scientists, when the interplanetary magnetic field (IMF) slants to the South there is faster "reconnection" between interplanetary and terrestrial field lines, initiating a rapid release of magnetic fields and plasma from Earth's sunlit side. How this happens, as well as how it begins, are still controversial subjects. In nature energy cannot be destroyed, as the conservation of energy law states, instead it changes state. For example, when electricity powers a motor and spins a shaft, the electromagnetic force is converted to kinetic energy through angular momentum. It is thought that so-called "magnetic energy" can also reappear in different forms. During "reconnection" events, conventional viewpoints say that some of the magnetic energy becomes heat, increasing the velocity of plasma ions and electrons that drive electric currents in a circuit linking the plasma sheet with Earth. Said Larry Lyons, UCLA professor of atmospheric and oceanic sciences: "We all have thought for our entire careers—I learned it as a graduate student—that this energy transfer rate is primarily controlled by the direction of the interplanetary magnetic field." Astrophysicists have found that the IMF can fluctuate in both intensity and orientation. When the UCLA team analyzed radar measurements of the ionosphere, auroral substorms were seen in that part of Earth's upper atmosphere ionized by solar radiation. The results surprised them. According to Lyons: "Any space physicist, including me, would have said a year ago there could not be substorms when the interplanetary magnetic field was staying northward, but that's wrong. 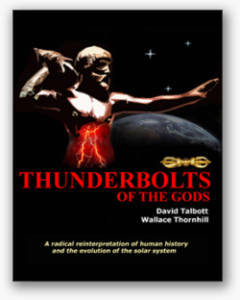 Generally, it's correct, but when you have a fluctuating interplanetary magnetic field, you can have substorms going off once per hour." In the electric Sun hypothesis, there is no "magnetic reconnection," so there is no mystery. The Sun is an anode, or positively charged electrode in the vast electric motor of the galaxy. The cathode is an invisible "virtual cathode," called the heliosphere, at the farthest limit of the Sun's coronal discharge, billions of kilometers from its surface. This is the double layer that isolates the Sun's plasma cell from the galactic plasma that surrounds it. In the Electric Universe model, most of the voltage difference between the Sun and the galaxy occurs across the heliospheric boundary sheath. Inside the heliopause the weak electric field centered on the Sun is enough to power the solar discharge. As the theory states, an e-field focused on the Sun accelerates charged particles: the faster they accelerate, the stronger the field. It is that change in particle acceleration that causes the IMF variability and the changes to the electrical input to Earth's magnetosphere. 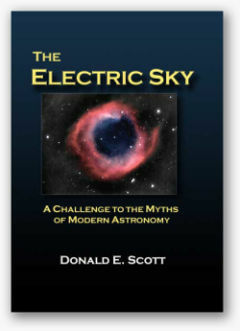 More info Professor of engineering Donald Scott systematically unravels the myths of the "Big Bang" cosmology, and he does so without resorting to black holes, dark matter, dark energy, neutron stars, magnetic "reconnection", or any other fictions needed to prop up a failed theory. 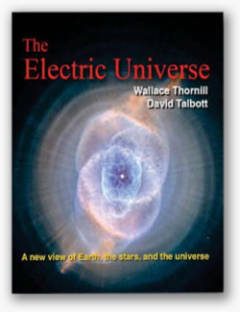 More info In language designed for scientists and non-scientists alike, authors Wallace Thornhill and David Talbott show that even the greatest surprises of the space age are predictable patterns in an electric universe.